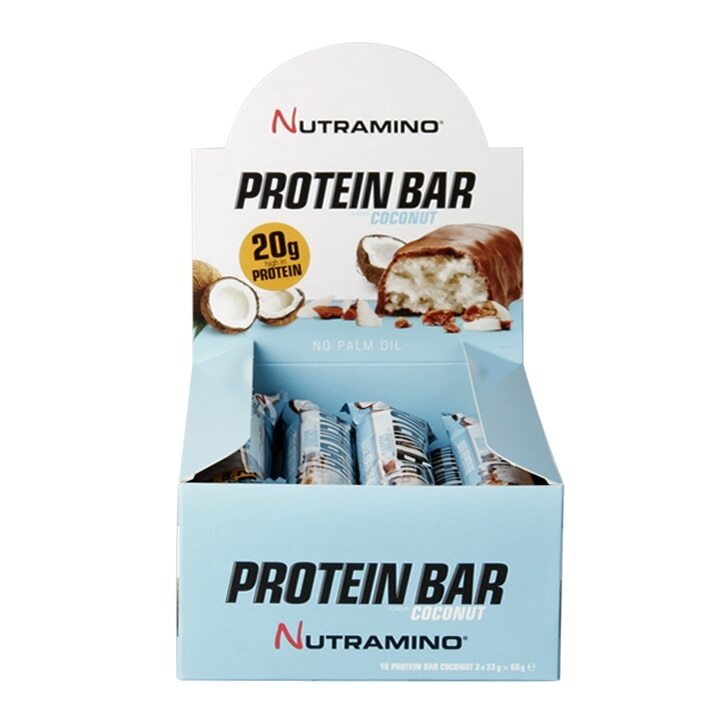 Nutramino Protein Bar Coconut is a protein bar that tastes like a dream with a delicious combination of genuine grated coconut and chocolate without trading its protein content. You will get as much as 20g of protein, which your body needs after your workout, all wrapped up in a unique taste and texture that beat any sinful chocolate bar. To increase protein intake after workout, or as a protein-rich snack on-the-go. Milk chocolate with soy protein (30%) (sugar, cocoa butter, soy protein isolate, whole milk powder, cocoa mass, lactose, emulsifier: soy bean lecithin, sunflower lecithin, natural vanilla flavouring), milk protein (20%), sugar syrup, grated coconut (12% ), humectants: sorbitol, glycerol; hydrolysed collagen, palm oil, glucose syrup, flavourings, preservatives: potassium sorbate. Nutramino Protein Bar Coconut is rated 4.8 out of 5 by 16.